This cheese was a fortuitous accident! By mistake I made a Bloomy Ricotta. About seven weeks ago, I made normal whey ricotta from the leftover whey from two cheeses, Camembert and Queso Fresco. 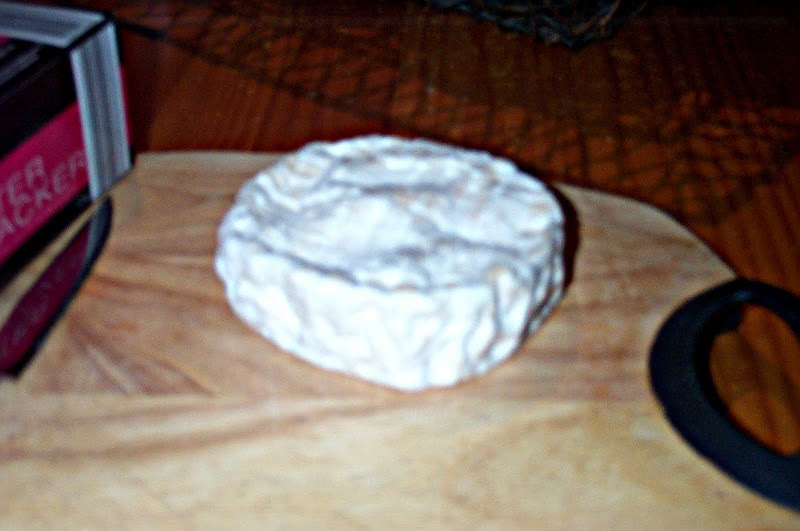 The starter culture that I used for both was Sacco MO36R, and I added Penicillium Candidum to make the Camembert. 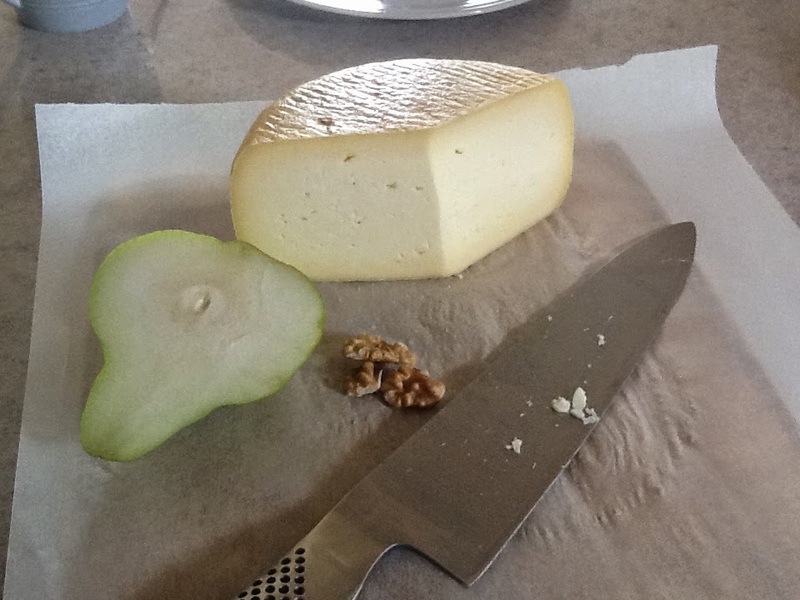 Once I finished making both the Camembert and Queso Fresco, I heated the remaining whey to 92°C (197.6°F) and recovered the Ricotta with 1/4 cup of apple cider vinegar. I drained using butter muslin, and added 2 teaspoons of salt to the cheese. Anyway, it was too salty, so I left it in the kitchen fridge and forgot about it for 7 weeks until my wife found it and questioned me about it. It appears that the whey still had enough P. Candidum left in it to breed in the conditions that I stored it. I kept the Ricotta in an airtight container in the kitchen fridge at 4°C (39.2°F). Here’s the quick video I put together to show you this creation. I believe that the additional salt helped preserve the cheese better for longer. Normally I would only add 1 teaspoon of salt to Ricotta made from 6 litres (1½ gal) of whey, but got distracted and over salted. I am actually surprised that the P. Candidum imparted a lot of flavour into the cheese and somehow reduced the overall saltiness. It could be my tounge playing tricks on me, but this was certainly an improvement on the original Ricotta! So all these little events led to the creation of my Bloomy Ricotta. Blooming marvelous I say! If you are after supplies to recreate this cheese, please visit Little Green Workshops. Camembert is one of the more trickier cheeses to attempt to make. It is not for the faint hearted, even if you have a bit of experience under your belt. I can honestly say that I have only gotten this cheese to taste right two times out of the four times that I have made it, so you can take this post with a grain of salt if you like. 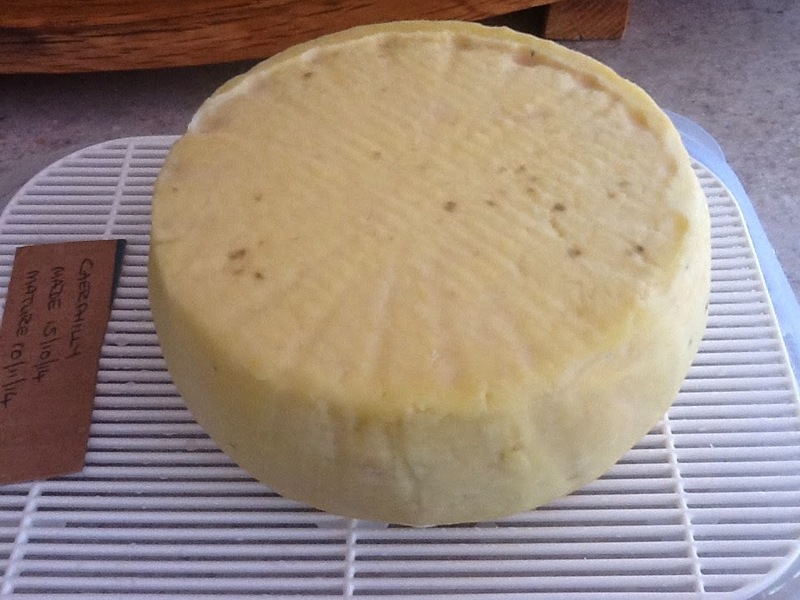 However with that said, one of the two attempts of making this cheese that I did get right, I lucked-in and recorded this session via a video tutorial of the process, and have some photos of the aging process. Here is the video to begin with so you understand the process of how to make Camembert. It is quite different to semi-hard cheeses and does not require a press. So that is how you make it. Sterilise all equipment in the large pot with about 3 litres of boiling water for 15 minutes, except cheese hoops. Use a very weak, diluted bleach solution for the hoops and rinse thoroughly with fresh water. Heat the milk to 32°C (90°F), then stir in the starter culture, and the Penicillium candidum. Cover and allow to ripen for 90 minutes. Whilst maintaining the target temperature (32°C), add the rennet and stir for two minutes top to bottom. Cover and let sit at target temp for 60 minutes or until you have a clean break. Cut the curds into 1.25cm (½”) cubes, and gently stir for 15 minutes at target temp. Let curds settle for 15 minutes, maintaining temp, then drain off the whey to the level of the curds using the ladle. Place the all four hoops on two of the sushi mats, and gently ladle the curds into the hoops until you reach the top. Cover both pairs with the remaining sushi mats. Let drain for one hour at room temperature. As in the video, you will notice a fall in the cheese as the whey expels. Flip over the cheese, using the mats, holding top and bottom to ensure that the curd does not come out of the hoops. Make sure the curds do not tear. Flip the cheeses every hour for 5 hours. Gently pull off the hoops and lightly sprinkle with cheese salt and gently rub all over, and allow to rest for 10 minutes for the salt to absorb. Place cheeses, which will still be on a mat, into your ripening box, and store at 7°C (45°F) at 85 percent humidity, and into your cheese fridge. The normal fridge will work at a pinch, but maturation will be slower and will take usually take about 8 days for the mould to form. After 5 days mould should appear on the surface. Turn the cheese over, put back in the ripening box and back into the cheese fridge. Continue to age for another 7 to 10 days. The cheese should have a good layer of mould on the surface. Take the cheese out of the ripening box and wrap it in cheese paper/film/wrap. Allow the cheese to continue to mature at 7°C (45°F) for another 3 weeks. Test one cheese to see if it has a mild flavour. If so, then store the remainder at 4°C until consumed. If not, wait another week, as the flavour gets stronger with age. 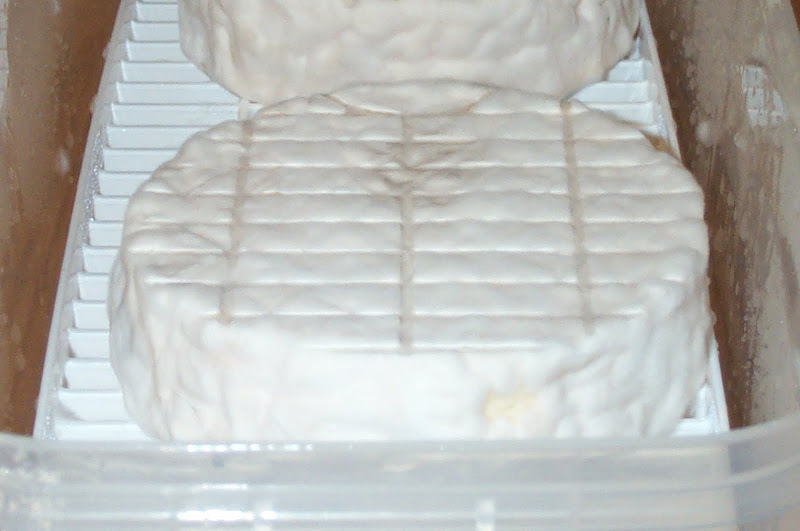 Camembert aging in ripening box. One point of difference from the video. You may have noticed that I kept filling up the hoops with curd as it drained away. I would not recommend this any more Fill it up once, and maybe top it up once more after 15 minutes, but no more, because the cheese will be too heavy and will collapse in on itself during aging. Get extra cheese hoops if necessary. I was quite lucky that these ones turned out okay. You must keep the cheese separate from all the other cheeses in your cheese cave. So to do that, you can use something like this nifty two layer box. In the bottom layer, I put a sushi mat and a little bowl of water to increase humidity. If you can source a fine weave food safe plastic mat, you will find that the cheese will not stick as readily to it, as it may to sushi mats. I find that the plastic stand that I use in my cheese ripening box helps to avoid sticking. Drain any water that collects at the bottom of the container, making sure that the cheese does not come in contact with it. The water will inhibit mould growth, which at this stage is a bad thing. Your cheese should look something like this before you wrap it in cheese film. A consistent white mould all over the cheese. There should be no black mould. If there is, just pick it off with a sterile knife. Don’t wipe with brine or vinegar as this will destroy the white mould layer. Then make sure you use the cheese wrap. It helps to slow the mould so that it doesn’t ripen too quickly. I made it once without the cheese paper, and the Camembert was far too ripe for my tastes. 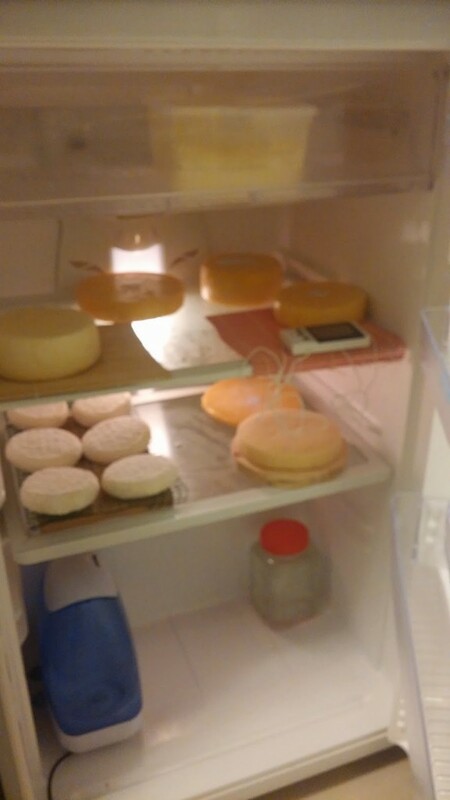 If aging in a normal kitchen refrigerator, the cheese will take a little longer to form mould and age. Make sure that you check it regularly until you get an even mould all over the surface. Then use cheese wrap as mentioned above. It may take until week 4 to fully mature, but still check at the 3 week mark. Also, if this cheese is matured above 7°C, the flavour will be overpowering and stink to high heaven! Make sure you keep it below the this temperature. Hopefully, I have given you enough information to successfully make Camembert. This cheese is worth the perseverance if you do not get it right the first try. The taste is amazing once you master the skill of making Camembert.